Wiley Drake screams for help from Rudy Davis! – Kent Hovind v. Robert Baty – The Great Debates! Home→Wiley Drake screams for help from Rudy Davis! Wiley Drake screams for help from Rudy Davis! Rudy Davis (aka LoneStar1776) has just issued an emergency call for help on behalf of Wiley Drake of the Buena Park First Southern Baptist Church in California (and so much else) because of some dispute with the IRS and a notice received threatening seizure. I always figured Greg Dixon set up his confrontation with the IRS in order to try and keep from having to deal with the fact that he decimated a reported 8,000+ member Baptist church and reduced its membership to below 1,000 because they didn’t want to put up with his anti-government theology. It was a neat trick. What better way to get rid of the albatross around his neck, the Indianapolis Baptist Temple property, that he could no longer maintain and was way too big for the dwindling membership. Maybe Wiley has the same sort of thing in mind as he plans his retirement like Dixon did. By the way, Rudy, you didn’t really give any details about the tax problem underlying the collection notice. The same sort of thing came up earlier and you/Wiley made some sort of claim the matter had been settled, and now here it is seeming to come around again. Just what is the underlying tax all about? What has Wiley been doing all this time to try and get it resolved. Seizing the property is a course of last resort for the IRS. Where is the record of what Wiley has been doing all this time? Or has he just been ignoring the IRS? Looking forward to seeing how this comes out and what all the excitement is really about. Wiley Drake featured his IRS notice on tonight’s live, conference-call, U-Stream broadcast. I called in to listen and just maybe discuss a thing or two with him about the notice. As it turned out, Rudy & Erin Davis also called in and the 3 of us were the only ones to talk about the issues. Someone else called in to say they would be bringing ice-cream by for the services after the broadcast. I let Rudy and Erin have their say and didn’t decide to actually try and engage Wiley until around the 45 minute mark. I asked him for actual details as to what had been going on for years leading up to the notice; instead of just listening to him claim he didn’t owe anything (Hovind-style). I got him to admit a lot had been going on and that his “CPA and lawyer” had been doing a lot over time, but not substantive details were actually revealed. It could be that Wiley doesn’t really know the details. He certainly didn’t reveal any. I also wonder whether his claimed CPA and lawyer are really a CPA and lawyer. 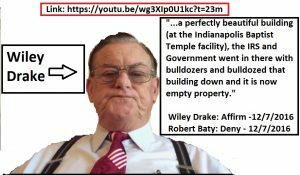 A couple of times during the show Wiley also just happened to mention the Indianapolis Baptist Temple (IBT), Greg Dixon, and the Government/IRS bull-dozing of the IBT building(s). I challenged him on that, stating I have seen no evidence of that but was aware the new owners, consistent with their construction plans, did some bull-dozing. Wiley asked about the prospect of accepting eye-witness accounts. I told him that I had not seen any such evidence and the matter passed. After doing a little more browsing, I am all the more impressed that the “CPA” and “Attorney” Wiley claims to have used were not licensed in those professions. Maybe we will hear more about that. I don’t think he even named the CPA, and Steven Davis, the alleged attorney appears to have been trained as one and practiced as one but may no longer be licensed, and I saw nothing to indicate he had any special expertise in tax law. I suspect whatever those 2 did to represent the church before the IRS on the payroll tax issues was not competent and we’ll never be given the documents to show what they’ve been doing the last few years to get the matter resolved. Wiley’s message to the IRS today! Is Wiley Drake just another con-artist Baptist preacher like Kent Hovind? From what I have just observed, it seems to be the case (not that there wasn’t plenty of evidence of it before). Today, Wiley Drake made a broadcast of less than 2 minutes announcing he would not have a show tonight because he is going on a Carnival Cruise with his kids. A week ago he was talking with his legal side-kick about his upcoming December 21, 2016 court date resulting from his misbehavior at a VA facility not long ago that resulted in his arrest and release, with a “ticket”. Wiley and his side-kick sounded like they were going to pull a Hovind instead of going to trial and risking some “hard time” for Wiley. That is, they talked about paying the $80.00 fine and then filing a Bivins suit against the arresting officers. While Wiley can go pro se, like Kent, and prosecute that case, it does cost a little money. Wiley said he didn’t have the $80.00 to pay the fine and would be asking interested veterans to fund his Bivins action in federal court. Like Hovind, Drake lives the high-life and travels the country doing, apparently, just about whatever pleases him, and claims he never has any money and so keeps milking sources for funding.